NDO/ VNA – The programme on computing education for people with vision impaired was launched at the talking book library for the blind at 18B Dinh Tien Hoang Street, HCM City, on March 25. The programme was supported by Microsoft Vietnam and the talking book charity fund to teach the blind how to use computers and access the Internet, the huge source of information. It aims to help develop the capabilities of the blind and prepare them for computing career opportunities. The project will be carried out for a year and each course will be run in three months with 15 students. Its curriculum was designed by a group of people with vision impaired under consultation from Microsoft Vietnam staff while all ten lecturers are also the blind with university degrees. Director of the talking book library Nguyen Huong Duong said the programme is expected to not only benefit the attending blind but also inspire the blind community to study information technology for social integration. 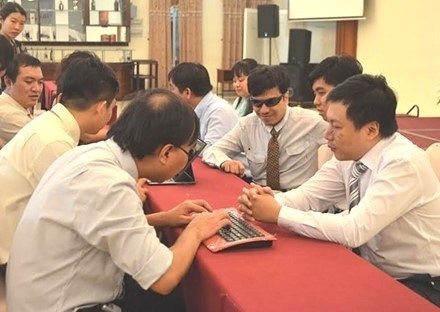 Microsoft Vietnam hopes that it will open up more opportunities for people with impaired vision and help them improve their life quality, Director of Legal and Corporate Affairs Pham Khoa said, adding that if successful, the project will be scaled up across the country. During the launching event, the Tan Nam Do Trading Co. Ltd donated 30 computers to the talking book library and Vietnam Foundation presented the library with 77 computers with no screen for the blind.